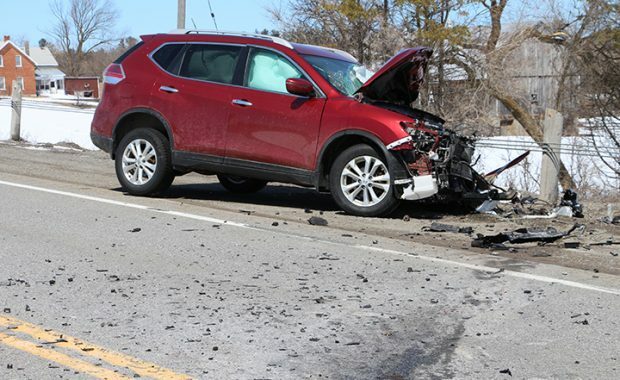 COBDEN – On April 11, there was a serious crash on Highway 17 near Mountain Road involving a red SUV and a transport truck laden with lumber. Debris from the vehicles littered the highway, which was closed for a number of hours. The transport left the highway, went down a small embankment, shed its load forwards taking the cab shell off the vehicle and careened into a home at the corner of Cornerview Road. Firefighters from Whitewater Region Fire Department were called to extricate both drivers. “Definitely different,” was the way a 33 year veteran of the fire department described the scene. Acting Chief, Terry Moore also said, it was unusual for two drivers to need extrication at the same accident site. 10 firefighters responded to the call. Moore said, the Cobden fire hall crew attended to the extrication of the transport truck driver who was still in his seat despite the load and cab shell shifting forward. The Hailey Station fire hall crew attended to the extrication of the driver of the SUV. The front and rear airbags had activated in the vehicle. Moore said the two vehicles coming to rest some distance apart simplified the extrication process. It was easier for each crew to bring their equipment to the two sites. OPP Provincial Constable Shawn Peever said both drivers were transported to hospital by land by the County of Renfrew Paramedics. He said they were both suffering from non-life threatening injuries. Moore said, due to the force of the impact of the cab shell and lumber, part of the house had to be taped off with yellow hazard tape.